As a little girl I made a memorable visit to the United Nations in New York. It was the summer after third grade so I must have been all of nine, but I remember being struck by all the different flags and all the different people. It was and is a place where those of many nations come together to seek the good of all of us who share this big blue marble of a planet. As a now much older woman, middle-aged at 56, I have seen the United Nations at work in the refugee camps in Lebanon that are filled to overflowing with those who have fled the war next door in Syria. UNHCR, the United Nations High Commission on Refugees, is stenciled on the tents and on shipments of food and supplies. Nations have come together to provide for those in need, and there are millions upon millions in need. But I think the biggest purpose of this organization is to somehow help nations come together to talk and to prevent such wars, and maybe even to stop those already in progress. I think the bigger purpose is peace, and it is seems impossible in these days to achieve. The stories I heard in Lebanon about what is happening in Syria are overwhelmingly horrible. Loss of work. Loss of home. Loss of life. No peace. 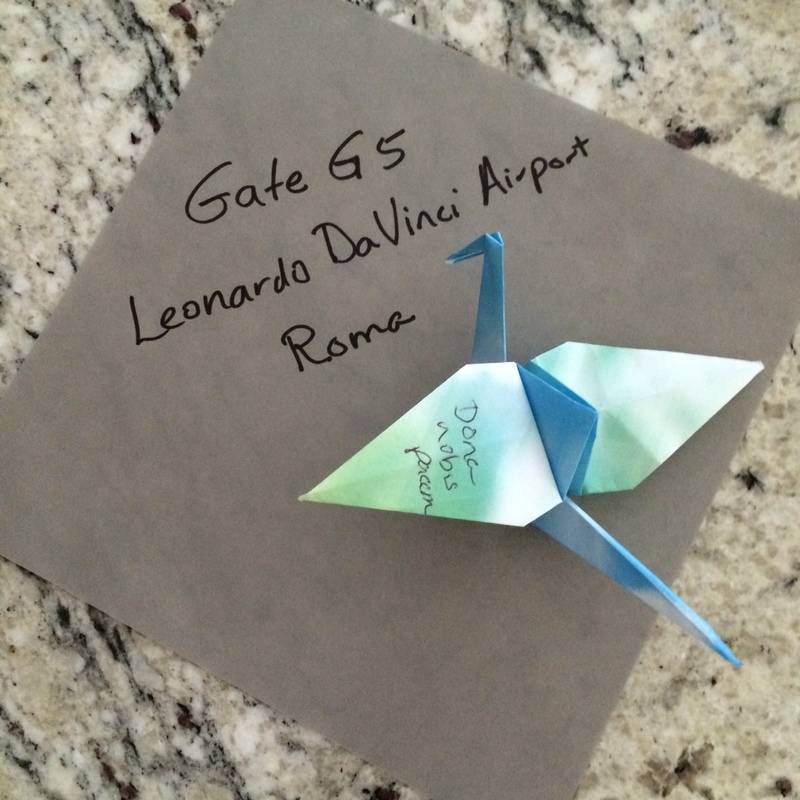 Gate G5, Leonardo da Vinci International Airport, Rome, Italy, happened. My plane from Beirut landed on time and my friend Meryle and I, who had spent those amazing days in Lebanon together as part of a team of eight women, said our goodbyes to each other. I sent her off to gate G3 with a hug as she headed home to Santa Barbara. I had two hours to settle into a seat at gate G5 until my Alitalia flight headed to Chicago was scheduled to leave. Gate G6 was next to us with a flight headed to Tel Aviv, Israel. My attention was drawn to those over there who seemed to obviously belong in Tel Aviv by their attire: long black coats with wide-brimmed black hats. Prayer shawl tassels dangling. Yarmulkas on the heads of several men, young and old. At my gate was a collection of all sorts of people, including many Muslims, some of whom had been on my flight from Beirut, including a sweet mother of two four-year-old twins who were heading to Chicago to visit family. The hijabs and abayas were visible, as well as the longish beards on some of the men. And I will say there were Christians, too, as I am one and I was there. So in the airport of the eternal city of Rome, not far from Vatican City where the patriarch of the Roman Catholic Church leads a large flock in the name of Jesus, at these twin gates – G5 and G6 – the three Abrahamic faiths were sitting together in peace, waiting to go someplace else. And then came the music. Not the swelling soundtrack of a movie scored by John Williams, that might be playing in my head because I thought I had discovered how to achieve peace, but actual music. There was a grand piano in the corner and someone sat down to play it. A woman with short, dark hair started picking out a jazz melody. A man quickly joined her to watch and listen, and she stopped, kind of embarrassed that someone would come over. They had a quick conversation about their joint love of music and the piano, and then he sat down and started to play. She stood by his side and periodically leaned over and added some notes on the high end. Soon, many were listening and smiling and just enjoying this spontaneous concert in the airport. And I looked around at the faces and everyone had just been transported someplace else as they listened along. Eventually these two stopped and others took their own turns at the ivory and black keys. Mary had a little lamb was plucked out, followed by row, row, row your boat. I’m a little lamb who’s lost in the wood, I hope I could, always be good to someone who’ll watch over me, had me closing my eyes thinking of my sweet Steve at home. Lord of all to thee we raise, this our hymn of grateful praise. She played four verses and added an amen at the end. I looked around again as we all stood up to have our boarding passes and passports checked before going down the escalator to get on the plane. I saw old and young. Blond and brunette and gray hair, some in dreadlocks piled high, some in the soft curls of youth, and some heads that probably claimed one of those kinds of hair but hadn’t seen it in a while. Men and women, boys and girls. Muslim and Hebrew and Christian and probably some who called on no God. Italian and Lebanese and Israeli and American and other folks from all over. And as our boarding was delayed, there was simply no pushing or shoving or shouting. There was just this music coming from the piano in the corner. And there was this kind of peace. I know that sounds naive and idealistic, but that’s who I am and I offer no apology for it. It was just a two-hour window at gate G5/6 in the Rome airport, but it reminded me of that hopeful memory of standing in the United Nations in 1968. And my prayers rose anew for peace. With the help of God, I think we can figure this out. For the love which from our birth, over and around us lies. Lord of all to thee we raise, this our hymn of grateful praise. Mystic Sweet Communion — The Outreach Foundation.